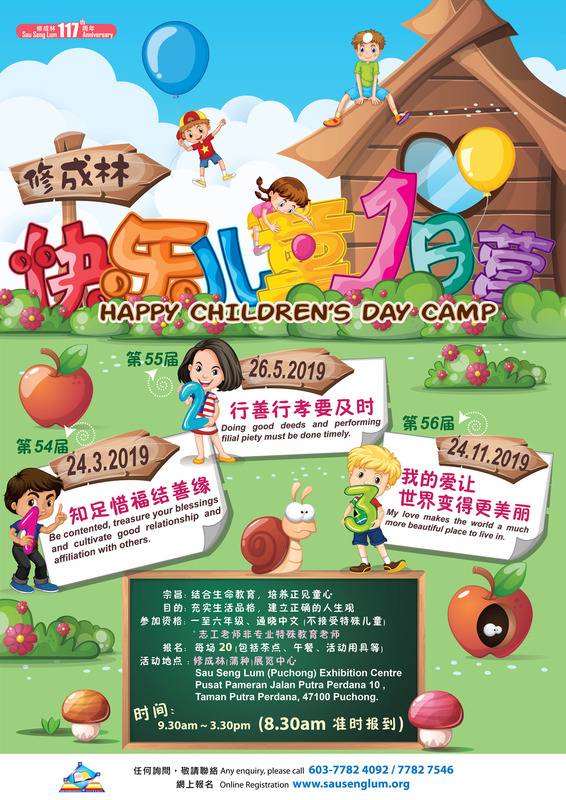 During every school term holiday, Sau Seng Lum organizes the Happy Children’s Day Camp at the Sau Seng Lum Puchong Exhibition Centre for children of 7- 12 years of age. The mission of this programme is to integrate life education, nurture childlike innocence, enrich life quality and establish a correct concept of life. Every session is carefully planned with interesting group activities, game sessions or educational video to encourage group discussion, sharing and practice. This ensures the children can truly understand and absorb the knowledge and ideas that are conveyed in the classroom. Mission: Integrate life education, nuture childlike innocence. Objectives: Enrich life quality, establish a correct concept of life. *Volunteer teacher is not a professional special education teacher. To ensure safety, parents must pick up children on time. No change of participant's name after registration. No change of dates/ cancellations will not be refunded after registration. Sau Seng Lum has the right to make amendments to programme. Pusat Pameran, Jalan Putra Perdana 10, Taman Putra Perdana, 47100 Puchong. Please attach bank-in slip with this form. 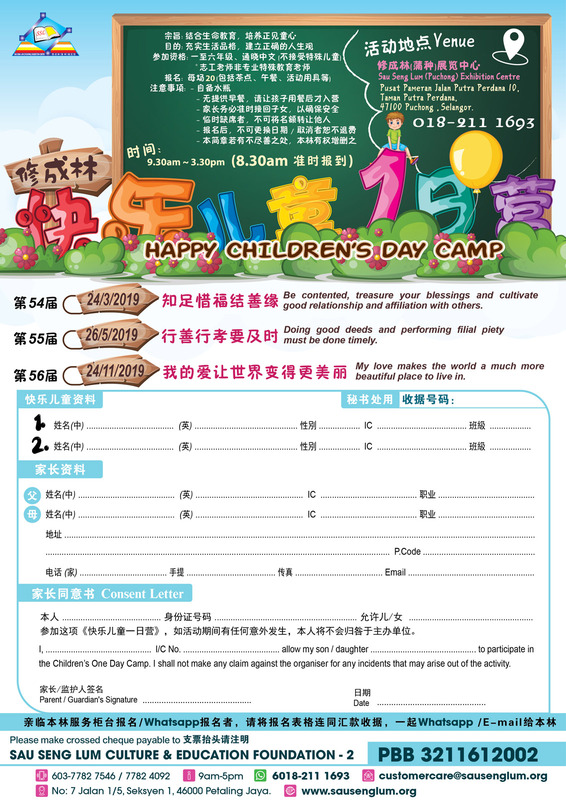 Make crossed cheque payable to "SAU SENG LUM CULTURE & EDUCATION FOUNDATION-2" and mail to No.7, Jalan 1/5, Seksyen 1, 46000 Petaling Jaya, Selangor Darul Ehsan, Malaysia with your name, I/C number and contact number. Note: If no proof of remittance or cheque is received, registration will not be processed. Please contact us at 03-77824092/77827546 for more information. Please enter your english name! Yes, I agree to the terms and conditions of the programme. No, I disagree to the terms and conditions of the programme.